Walnut Barley Burger from Otto's Pub and Brewery, State College. Photo Credit Brittany T.
I immediately thought of Otto’s Pub and Brewery, a restaurant committed to buying fresh, local produce – hence their motto, “Think Fresh! Buy Local! Drink Otto’s!” Food providers include Mt. Nittany Winery, The Cheese Shoppe, Ray Fye Farms, Gemelli Bakery, and Hanes Valley Growers. Otto’s is also well known for its beer list, which offers a selection of over nine draft beers with both seasonal options and year-round favorites. The first beer that caught my eye was the Apricot Wheat, and it did not disappoint. It was smooth, and the taste of apricot lingered in my mouth after each sip. My mother ordered the Spruce Creek Lager, a flavorful light beer minus the harsh aftertaste of a Miller or Coors. 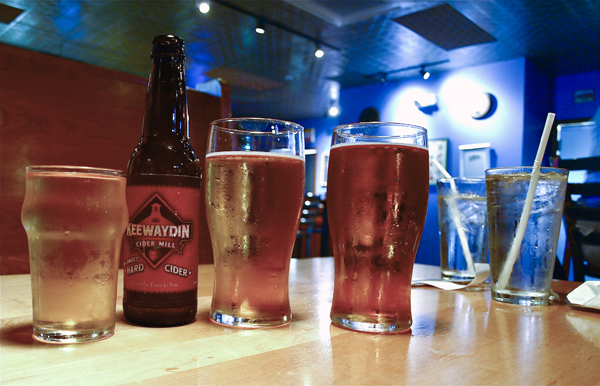 And my sister selected the sweet and tasty Keewadin Semi-Sweet Cider from Keewadin, Pa. While sipping our brews, we scanned the food menu. Every Thursday at Otto’s is Local Food Night, and the special that night was Hen from a nearby farm. The standard menu also includes quintessential pub food like Beer and Cheese Fondue and Butternut Squash Ravioli. After much deliberation, I decided on the Walnut Barley Burger. The burger is house made with brewer’s barley, walnuts, and long grain rice. It is grilled and topped with lettuce, tomato, and your choice of cheese. I selected American cheese and added garlic fries on the side. While waiting for our food to arrive, we enjoyed the comfortable ambiance of the bar area. However, you have only a few more weeks to enjoy this space! Did you know Otto’s is relocating later this summer to the former Quaker Steak & Lube on Atherton Street? The new digs will provide expanded brewing space and seating and plenty of parking. Back at its current and slightly more southern location, I anxiously awaited my Otto’s burger. And when it hit the table, I could have sworn it was a 100% beef patty. It looked fat and juicy and inviting. 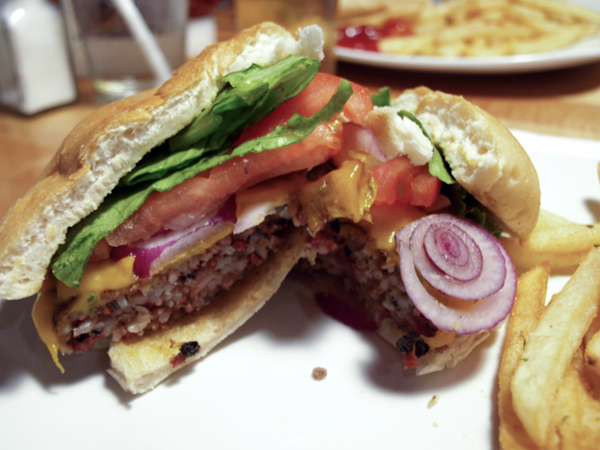 It was hearty, flavorful, and unlike any vegetarian burger I’ve had before. In fact, I am craving one right now! So the next time you’re considering where to spend your dinner money, I suggest you try Otto’s. Because while supporting neighborhood restaurants is important, supporting local agriculture is even more critical. And Otto’s is a unique place that recognizes the relevance of local ingredients. When eating at Otto’s you know you’re not only going to get a tasty meal, but it will also be good for your health, the environment, and the community. Otto’s just keeps getting better, and the new location will be a great move. Parking! Great post.